Bike Providence reports that there will be a hearing on February 8th to look at improvements to Pleasant Valley Parkway. Early word is that the new plan calls for one-way movement on each side of the stream, removal of one car lane, and addition of bike lanes on each side. It would end up looking like a small-scale Blackstone Blvd, if this is true. Currently, the roads on both sides of the median/stream BOTH allow 2-way traffic, with little room for cyclists and walkers, and extreme confusion at intersections. I’ve actually heard that they are going to put rotaries at either end. 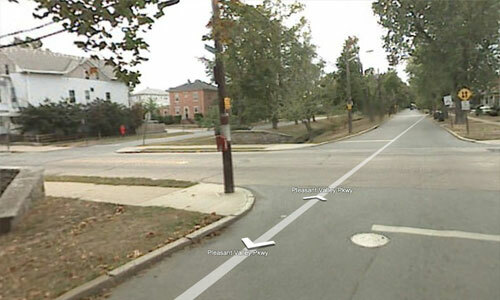 The section that runs north parallel to Academy Ave will remain 2 way on each side. As someone affected by this, I really hope this goes through. It would greatly increase safety in the neighborhood for pedestrians, bicyclists, and even drivers because of the more predictable traffic pattern that would be created at the 3 major intersections. I’ve already written to Councilman Soloman, copying the mayor, Rep Giannini (who lives on the Parkway), and Senator Goodwin, in support of this change. There’s really no reason to keep it the way it is. All the arguments in favor of the status quo boil down to convenience. As I recall the plan, wasn’t there going to be easier access to Chalkstone and a clearer path from the Promenade? I would be in favor of that if there is also a budget for landscaping, that passage along Roger Williams Med Center is one ugly stretch of decrepitude. The rotaries Jim mentions are promising too, but this is a place that just begs for more serious traffic control. I bike this route regularly because it is marginally safer because of the reduced cross-traffic, but that also encourages people to use it as a speedway and encouraging more traffic negates the advantages of having a bike lane. The crossings at Justice and by the RW Medical Center are terrifying experiences where cars pass through unmoderated intersections without slowing at all. I assume this is where the circles are going in, but I would love to see some serious speedbumps just to slow people down. Bike Providence has a follow-up post about the meeting.